As a teenager, I loved playing bass guitar and building things. I have always enjoyed using my hands and being creative. Today, in my home I am the designated builder; from book shelves to our baby’s nursery furniture. I love the feeling of seeing a project completed. I’m also a bit compulsive. Once I start a project I will not sleep until I finish my task to perfection. I’ve found these 2 qualities, working with my hands and perfectionism to be a tremendous asset in my chosen profession as a dentist. In the dental profession today, it seems that many dentists get distracted and just focus on teeth. As we know though, the mouth is the gateway to the rest of the body. Not maintaining a heathy mouth can lead to dire consequences to overall health. And, what happens elsewhere in the body effects the mouth as well. As a graduate of Columbia University College of Dental Medicine, this link was a mantra and focus of our academic studies. In many of our classes I learned beside my medical student colleagues. Understanding the interrelation between the medical and dental professions is what sets apart Columbia from other dental schools. Although the coursework was quite rigorous, Columbia University taught me not to underestimate the dental profession, and that as a dentist, I can have a profound impact on the overall health of my patients. I take this responsibility very seriously with each patient that I treat. At Tenafly Dental Associates, we utilize the latest technologies to detect and treat dental related issues. We educate our patients on how their mouths can affect their overall health. Most of all, we build trust with our patients and provide a warm, non judgmental atmosphere. I give my personal email address to all my patients as I believe there should always be a direct line of communication between the doctor and the patient. 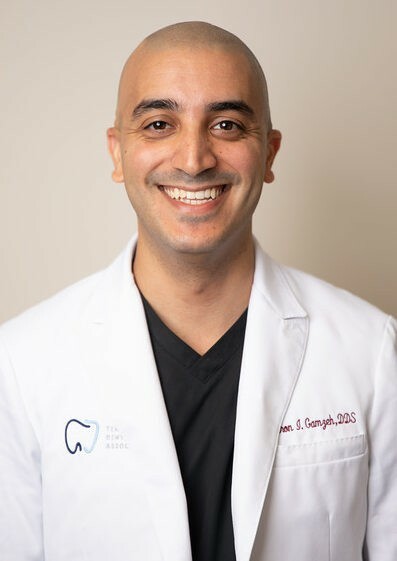 After graduating Columbia University College of Dental Medicine, Dr. Gamzeh went on to complete his residency program in general dentistry at the Veteran’s Hospital in East Orange, NJ. During his residency, Dr. Gamzeh treated our nation’s veterans who suffered from severe dental trauma, tooth decay, and damaging gum disease. With his calming and sincere nature, he was able to deliver the finest dental care to even the most anxious patient. Dr. Gamzeh is a member of the American Dental Association, the New Jersey Dental Association, and the American College of Prosthodontists. Dr. Gamzeh currently resides in Teaneck, New Jersey, with his lovely wife Dafna and his daughters Nurit and Ayla. Tenafly Dental Associates is now serving the communities of Tenafly, Englewood, Englewood Cliffs, Cresskill, Teaneck, Dumont, and Bergenfield.